The Wilson family vacation takes a dark turn when Adelaide, Gabe, Zora, and Jason (Lupita Nyong’o, Winston Duke, Shahadi Wright Joseph, and Evan Alex) encounter their doppelgangers. Chased, cornered and threatened, the Wilsons will have to kill or be killed, but ultimately the bigger questions will take more effort to answer, what do these dark twins want, and where are they coming from? 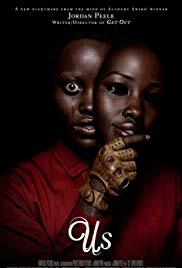 Written and Directed by Jordan Peele, this sophomore submission strikes hard with a concept that hearkens back to concepts of The Twilight Zone or The Outer Limits and works hard to create interesting and three dimensional lead characters in act I. Lively and quipy dialogue keeps makes our introduction fun and reasonable before the inevitable terror begins to strike in Acts II and III. Meanwhile, a handful of hat tips in homage to influencing horror and suspense films are lightly peppered throughout adding a wink and a nod to those in the know. Unfortunately, perhaps not as messaged and politically on point with subtext as 2017’s Get Out; what starts out and holds potential to really send a haunting message instead feels a bit less developed and more of a draft. None the less, great performances from the ensemble and a killer soundtrack to boot, this old-school influenced thriller bounces from start to finish. Jordan Peele for the win this weekend! Us is rated R.